New database in seconds | by Jesús Rodriguez – WELCOME TO OUR INTERNATIONAL SUPPORT! I have recently been getting many calls from clients needing to create an additional database for a number of reasons. Some have been given the task to create a database for a format like theirs for another market. A New Rock station may be shifting towards Classic Rock, CHR to AC, or vice versa. One client recently had a new automation system installed and needed to create a new database to begin implementing his new data without interrupting the one he uses everyday. Many of these scenarios have a high sense of secrecy because changes need to be made without assistants or other staff with access to the database seeing the changes occurring within it. When each one of these clients called, their first question is if there is a way to export and import certain things in MusicMaster. There are other blogs that can teach you how to export and import items in MusicMaster that you may want to take some time to read. After asking the clients what they are truly trying to accomplish, such as the examples I previously stated, I would tell them that there is an easier way that would take seconds. Many times, as users, we tend to bypass the window below and go straight to opening our database. 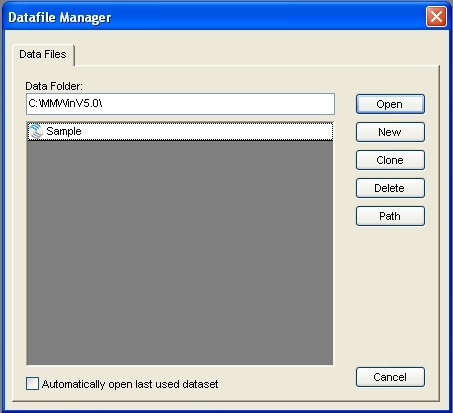 You’ll find information for what each one of the buttons does in the Help section of MusicMaster by searching Datafile Manager. Let’s be honest, it is pretty rare that you may need to use any one of those buttons during your day-to-day operations other than Open. It is very easy to forget that the others even exist, which was the case for my clients. One of the clients had their database setup for “Automatically open last used dataset” so being a programmer for only one station; he never knew the DataFile manager even existed. All of the scenarios I spoke of earlier were fixed in a matter of a few seconds simply by using the Clone option. Cloning has often been the best way to go because cloning within MusicMaster will allow you to make an exact copy of your current database. You will then be prompted to give it a unique name. Once the cloning is complete you now have an exact clone of your database that includes all of your clocks, library data, attributes, etc. and more importantly your rules something (you can not export). My clients could now go into these cloned databases and work behind closed doors making the adjustments they need to make for the station flip or any new project that has presented itself. This is great so that word doesn’t get out about any potential shake-up by someone with access to the original database who might see some added or removed music, adjustment to the clocks, rules, etc. during their daily MusicMaster usage.